“This shows that the differences between Zika and dengue are not at the level of being able to infect neural progenitors, but more about the harm Zika causes when it does infect those cells,” says senior author Peng Jin, PhD, professor of human genetics at Emory University School of Medicine. The first author of the paper is postdoctoral fellow Feiran Zhang, PhD. Zhexing Wen, PhD, now assistant professor of psychiatry at Emory, is a co-author. Jin ‘s lab collaborated with Hongjun Song, PhD and Guo-li Ming, PhD at Johns Hopkins, Hengli Tang, PhD at Florida State, and Wei Zheng, PhD at NCATS (National Center for Advancing Translational Sciences). 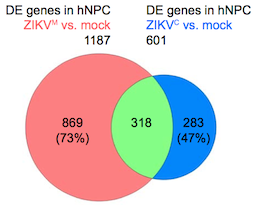 Zika induced changes that were more focused on genes involved on DNA replication and repair, indicating that Zika infection disrupts cell replication more. Zika and dengue are genetically related, and both viruses are transmitted by mosquitos. Dengue infection, which mainly affects cells in the blood, can lead to neurological complications. But it has not been associated with birth defects such as microcephaly in the same way Zika has. In comparison with African strains, infection by the Asian strain of Zika virus more potently affected the p53 gene and genes connected with cells’ responses to viral infection, such as interferons. Both Zika strains were able to infect and cause cell death in neural progenitor cells. P53, often mutated in cancer cells, is known as “guardian of the genome,” because it can promote DNA repair or arrest growth in response to DNA damage. The researchers tested whether pifithrins, compounds identified as inhibitors of p53, can protect neural cells from being killed by Zika infection. They can, although Jin cautions that pifithrins’ activity against Zika has not been tested in living animals. “The p53 pathway could potentially be targeted with other compounds that are well tolerated in humans,” he says. The neural progenitor cells used were derived from iPSCs (induced pluripotent stem cells), which were in turn derived from donor skin cells. The research at Emory was supported by the National Institute of Neurological Disorders and Stroke (NS079625) and the Emory Genetics Discovery Fund. Your blog is really good and proved knowledgeable for the community. If anyone is interested in postdoctoral fellowships then, here is “The Arnold O. Beckman Postdoctoral Fellows Award Program” available for the postdoctoral scholars. Fellowship Deadline: September 19, 2016. Applicants can get more information about the Fellowship through the given link: http://usascholarships.com/arnold-o-beckman-postdoctoral-fellows-award-program/. You can also join our Face book page to get the latest updates: https://www.facebook.com/MyUSAScholarships?fref=ts.